Yes, I am on a butternut squash kick again! 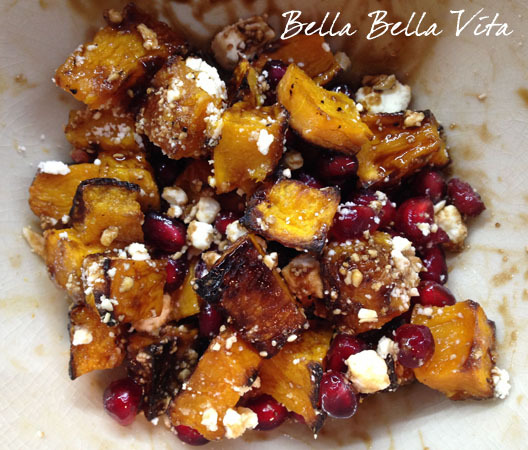 I created this Roasted Butternut Squash with Pomegranate & Feta recipe last year and it's quickly become a favorite. I love the colors of this dish and roasting the squash gives it a wonderfully caramelized flavor. Combined with the sweet tartness of the pomegranate seeds and tanginess of the feta, this dish hits the spot! And, I have been known to eat the entire lot of it in one sitting! My butternut squash infatuation started again after I made the Roasted Butternut Squash and Shallot Soup recipe I posted last week. I've been eating it every day this week! I highly recommend trying both of these recipes! * the BEST Balsamic Vinaigrette dressing (in my opinion) is from Cooking Light magazine. Click here to view. Toss the butternut squash in the olive oil and sprinkle with salt & pepper (I use a 2 finger pinch of both). Arrange on baking sheet covered with tin foil and coated with olive oil spray. Roast in oven at 425° for approx 25 minutes until soft and slightly browned (caramelized). Let cool and then mix in serving bowl with pomegranate seeds, feta cheese and drizzle with Balsamic vinegar or Balsamic vinaigrette dressing until lightly coated (I use approx 1/2 Tbsp). Enjoy! I buy butternut squash from Trader Joe's that has already been peeled and cubbed. It makes this recipe fast and easy to make! I use "The Godfather" traditional 18 year aged Balsamic vinegar from Ferrari Olive Oil Co. The quality of balsamic makes all the difference. I've also added arugula at times ... the peppery leaves add nice flavor and the green a great color pop. Beautiful to serve over the holidays. I'd love to hear what combinations you create when you roast your butternut squash. Please drop me a line!